A few of the new partners include the Austin Community College District, Northeast Mississippi Community College, and Northwest Kansas Technical College. A previously-announced one, the Alabama Community College System, will be adding more campuses. "We've seen firsthand how Apple's app ecosystem has transformed the global economy, creating entire new industries and supporting millions of jobs," said Tim Cook, Apple's CEO. "We believe passionately that same opportunity should be extended to everyone, and community colleges have a powerful reach into communities where education becomes the great equalizer." Originally launched on the iBooks Store, the curriculum is meant to guide people without any programming experience towards the goal of building a fully-functional app. While open-source, Swift is an Apple-designed language useful mainly for the company's own platforms. The company is also deploying the curriculum in "select" high schools this fall, but it has yet to mention any districts or individual schools by name. 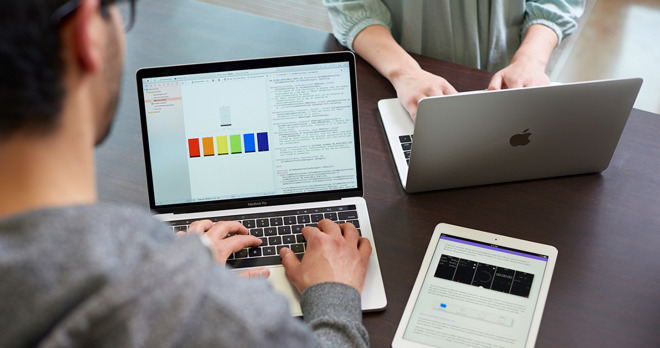 People wanting to try App Development with Swift on their own can do so for free, as long as they have a Mac, iPhone, or iPad.